I like sewing party dresses. 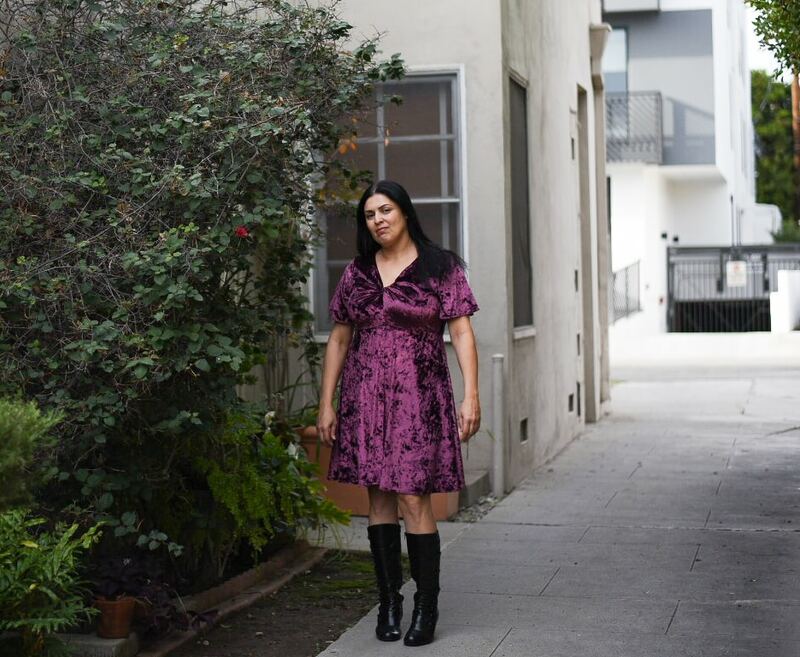 I love choosing a pretty fabric, selecting a fancy pattern with a special detail, and spend hours with a new technique. I make a muslin and tinker with the fit until it looks perfect. I hand-sew the hem, put it on one last time before I hang it, and then wait for some special occasion to wear it. I have a small but strong circle of friends, and if there is a special occasion to be had, it is always with them. And here is the catch: Because it is always the same people, that special party dress that took forever to sew, that caused such an impression among my friends… it cannot be worn again. So back into the closet it goes, to hang out with all the other beautiful party dresses that only saw one party before they spend the rest of their lives in storage. This is why I do not sew party dresses. Maybe if I were to expand my circle of friends, I would have more parties to go, but really, having a social life is exhausting, and Law and Order: SVU is not going to watch itself. So I focus my time on TNT patterns (hence my large collection of Megans, Delphines, and Plantains). 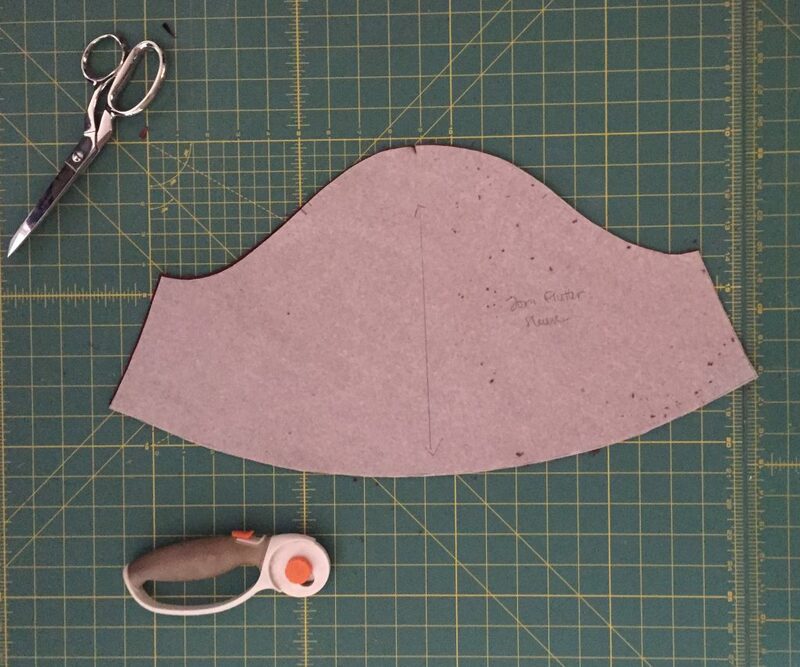 I can sew any of my TNTs quickly, efficiently, and successfully, and the idea of spending loads of time figuring out a pattern to use it only once feels like time not well spent (side note: I spent the whole month of October working on a costume—perhaps the most frosting of all garments—and not for a moment did I think it was a waste of time. My brain works in weird ways). About a month ago, I stopped by Joann to buy some fabric for some very practical projects—a couple of Plantain T-shirts, a Delphine skirt, and a Morris blazer. As I wandered through the store, I caught a glimpse from the corner of my eye: shiny crushed velvet in the most beautiful burgundy color. I came closer and touched it, and how delicious did the velvet feel! I tried to fight the urge to buy it. I tried to focus on the list that brought me there. I walked away, but the lure of the velvet was just too much for me to resist. And that was the moment I knew that this velvety dream of the 90s was meant to become a Joni dress. Here, I need to take a moment to gush about my boyfriend. I knew I was going to make a Joni, but I had no idea of how much fabric I was going to need or what other supplies I would have to get. I picked up the phone and called my boyfriend. I guided him to locate my copy of Tilly’s Stretch! among my sewing books and directed him to the page with all the information I needed. He read through the list and warned me that I would need clear elastic. He is a keeper. Because I was so afraid to mess up the velvet, I used some floral knit fabric I had in my stash to make a muslin. I cut a size 7 and opted for the shorter version of the sleeve. Sewing the muslin was a breeze; even the clear elastic went in easily. The regular sleeves looked weird to me—with so much volume up top (the Joni makes the girls look quite voluptuous) and at the bottom (the skirt is very flared), I would need some volume on the sleeves to balance everything out. 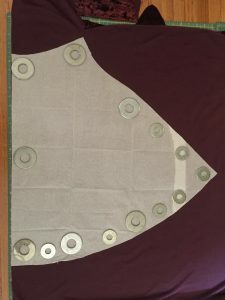 I also decided to take a horizontal slice from the bodice as I felt that there was too much fabric pooling on the chest area. I was ready to dip my fingers into frosting. Sewing with stretch velvet was a lot easier than I imagined. I totally got away with cutting the pieces on the fold or in two layers using rotary cutters. I used Wonder clips to hold things together because I could not get any pins to pierce through the fabric. As usual when sewing knit, I used a stretch needle and a narrow stitch. I was concerned about sewing the elastic, but it happened without much effort. The only time I experienced creeping (hahahahaha—makes me laugh every time!) was when sewing the bodice to the skirt. SO MUCH CREEPING! 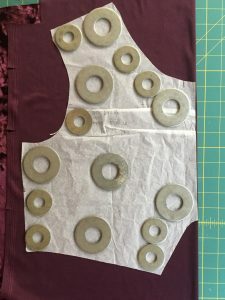 I used the clips AND basted the two pieces, which made everything very stable and easy to machine sew. All seams were finished with my serger. I followed Tilly’s instructions for most of the construction process. 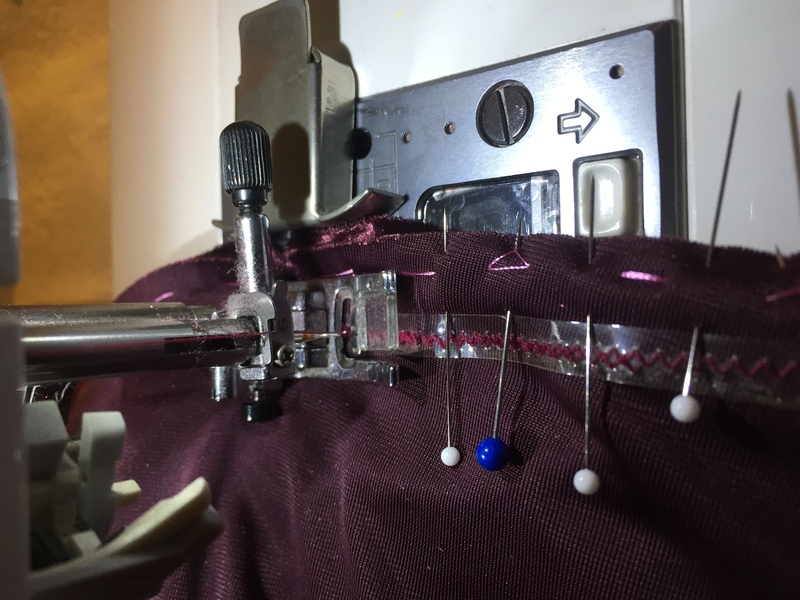 I chose not to listen to the advice about stitch length, and I got in trouble for it–my sewing machine tried to eat the elastic. I quickly realized that Tilly knows best and followed every step exactly as she laid them out. 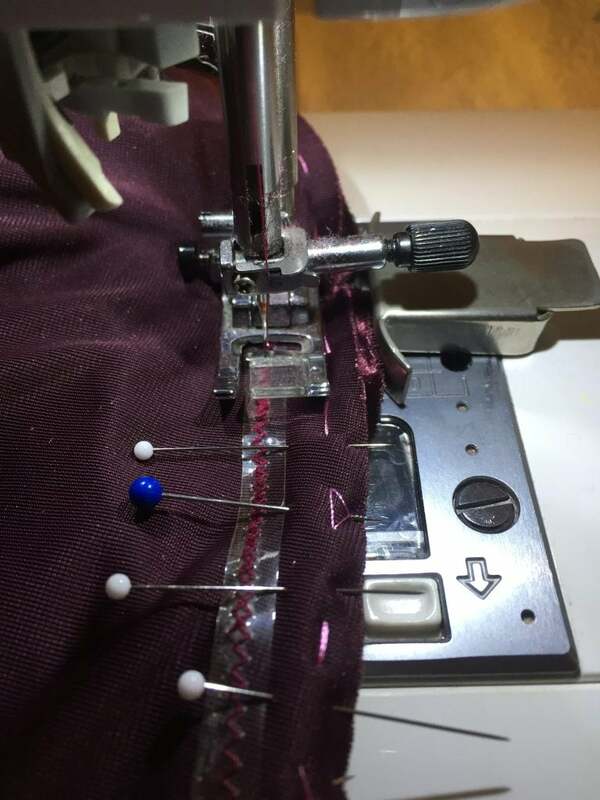 When it was time to sew the hem, however, I changed things and used a narrow hem. I serged the edge, folded it twice, and finished it on my sewing machine. Had I been using a less temperamental fabric, I would have followed the original instructions, but the velvet was just too slippery (and I was too lazy to stabilize the hem). I am very pleased with the narrow hem. I am beyond happy with the result. The dress is very flattering and super comfortable. And that color? I feel like a raspberry dream! I still have not decided where this dress will take me. I will be spending Xmas in Brazil, where it will be one million degrees and 200% humidity, so velvet is out. My boyfriend and I will be celebrating NYE in Los Angeles, and I hope to dance the night away, so this Joni might be helping me welcome the new year in retro 90s style.